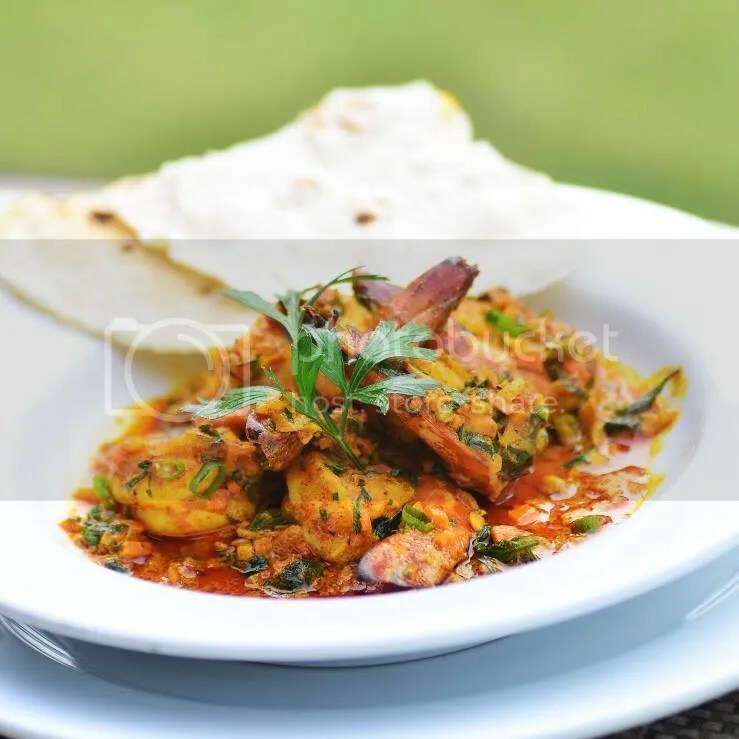 Travelers like us may not readily acknowledge it, but in many ways, we unconsciously define our experience in a hospitality establishment by the quality and variety of food being served. In fact, in many inns, B&Bs, hotels, and other places we have stayed, we always look forward to enjoying the meals—and the accompanying service and atmosphere—that they offer. 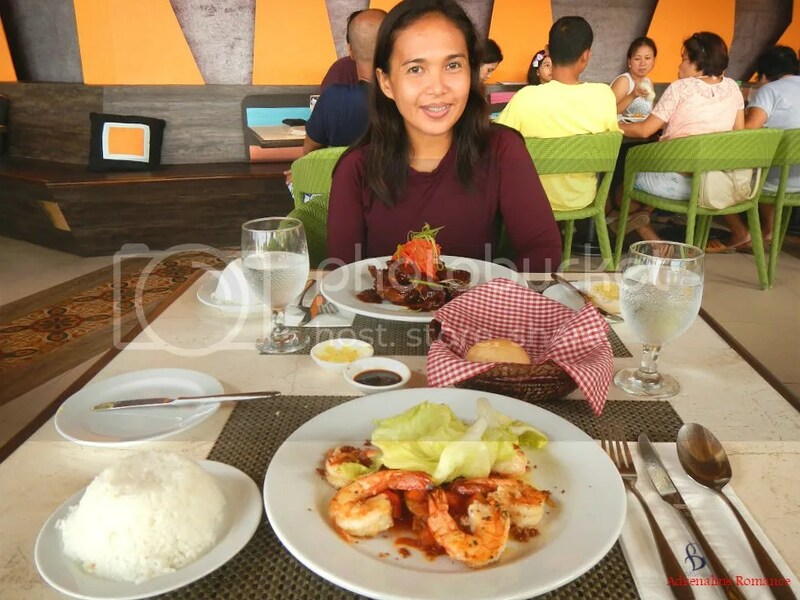 Our never-ending quest for pleasant gastronomic immersions made a major stop in The Marea Al Fresco restaurant in The Bellevue Resort in Bohol. And what a culinary experience we had! 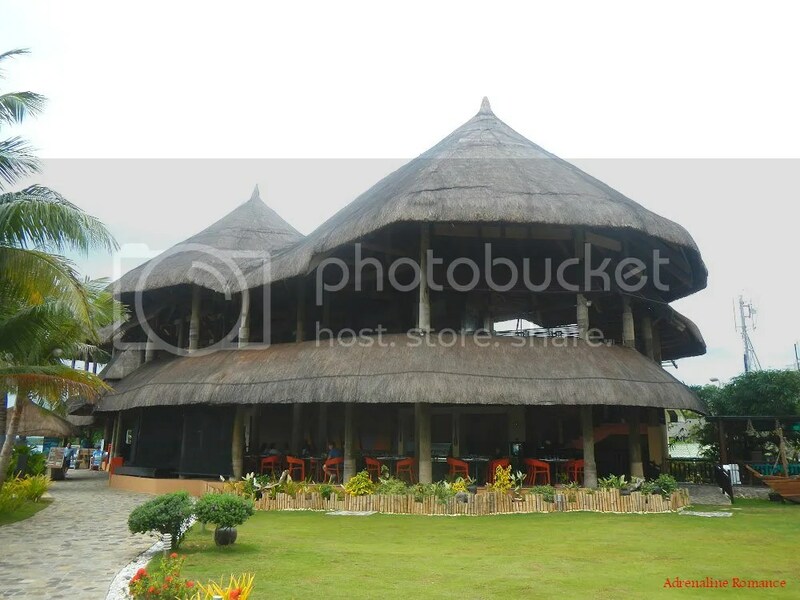 The Marea Al Fresco restaurant is housed in this open-air building that is obviously inspired by traditional nipa huts that are prevalent all over the Philippines. 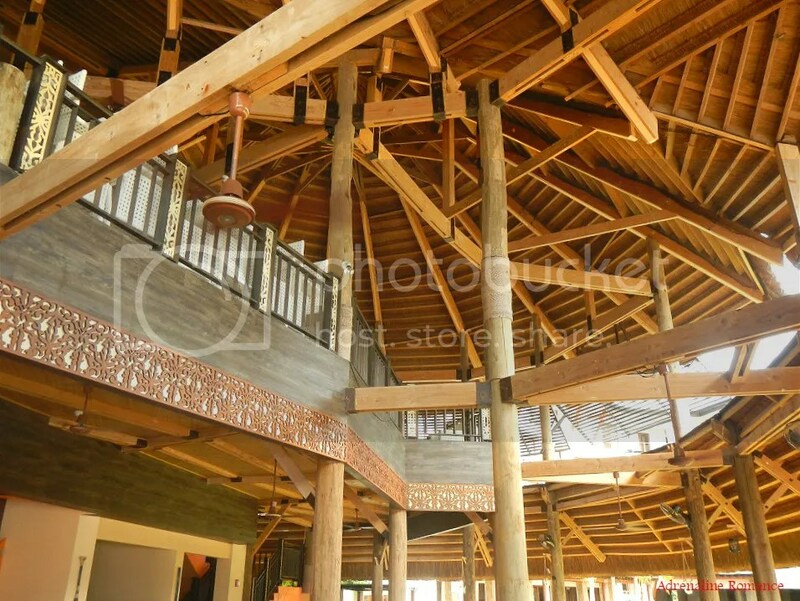 More wood and nipa sheets and less concrete and steel comprise the construction materials in this restaurant. 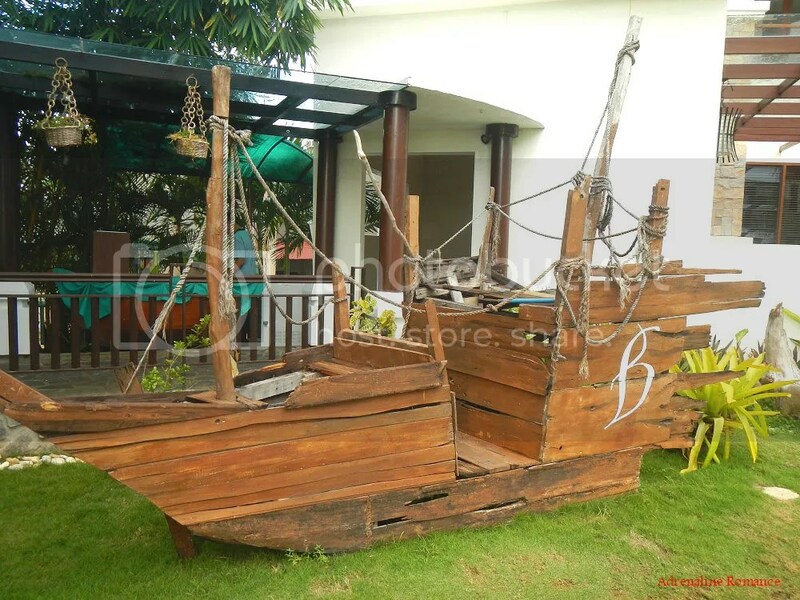 A wood sculpture of a wrecked Spanish galleon stands in front of Marea. 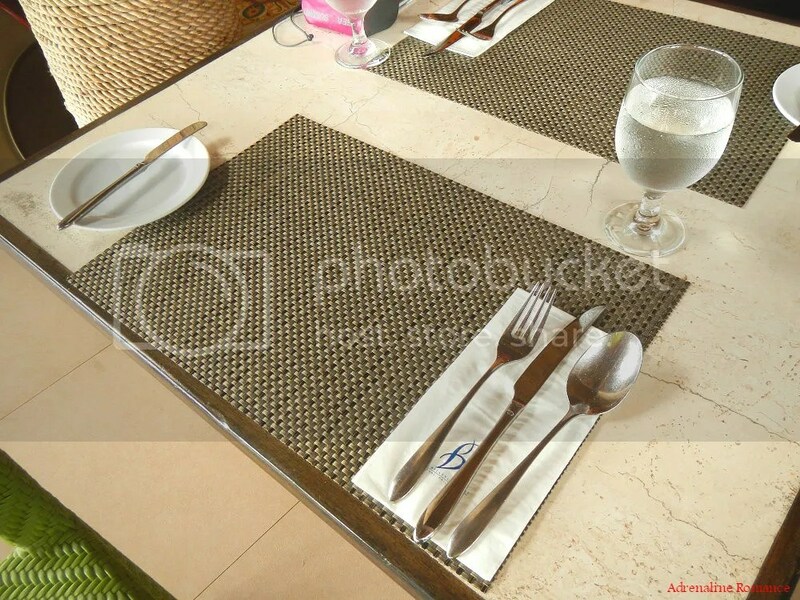 Guests can have their souvenir photos taken here before dining. The restaurant is bordered by a nice green garden. 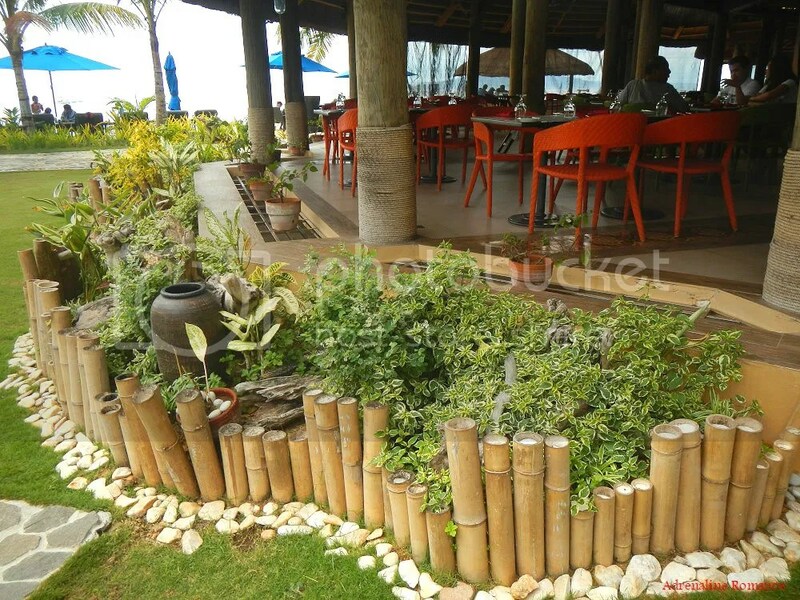 Check out those bamboo retaining walls. They look really organic, natural, and beautiful, don’t they? Without walls and windows, the cozy dining area is comfortably airy. It has enough space and tables to seat 150 guests. Combined with wall-mounted fans, the high, ceiling-less roof allows the air to circulate more efficiently throughout the dining facility. Massive wooden rafters and beams provide structural framework as well as a warm, classic, aesthetic look. Diners can enjoy the view of the infinity pool, hotel grounds, and the ocean while enjoying filling and delicious meals. 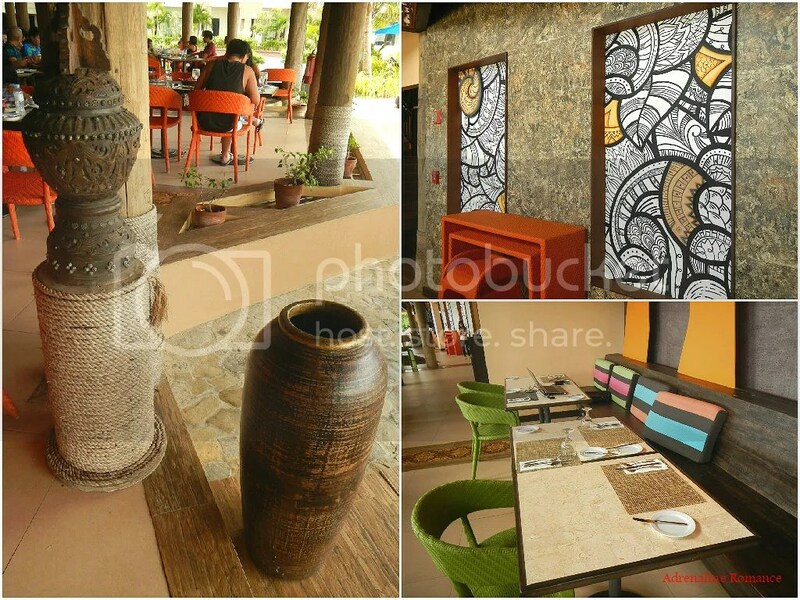 Ethnic-styled stained glass windows, traditional jars and pots, and woven pillow covers adorn the place, giving it a very tribal Filipino feel. 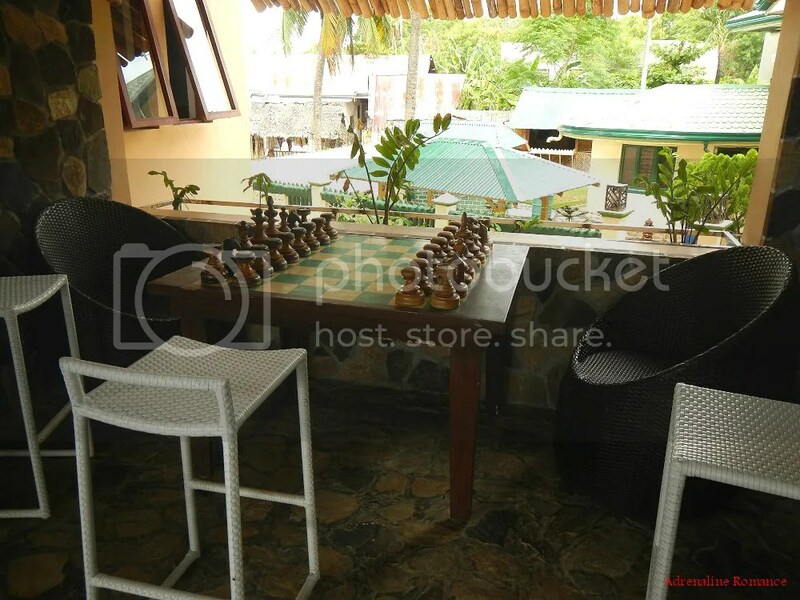 While waiting for your meal to be served, you can play a nice game of chess with a friend or special someone. The pieces are huge! The best meals deserve the best utensils. As the restaurant’s name implies, meals are served à la carte style. That means, unlike a buffet, you order from a menu. 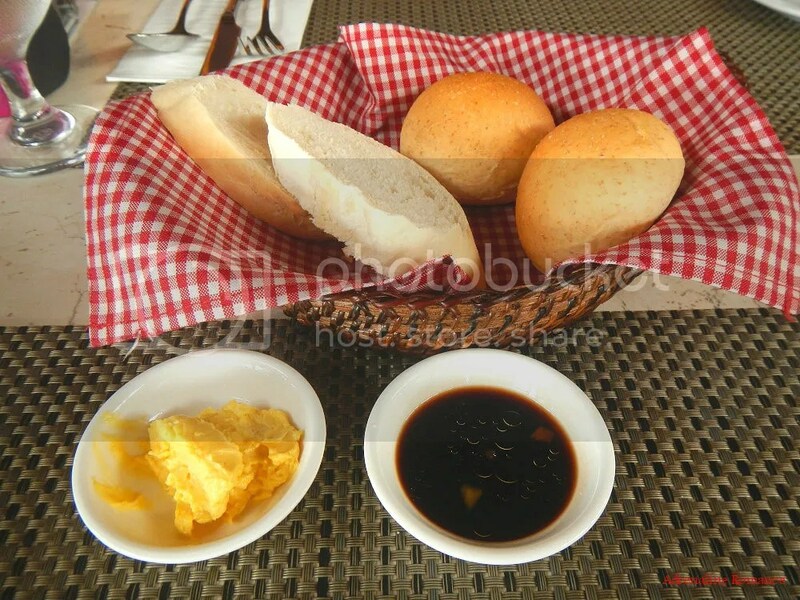 While waiting for our orders, friendly staff served us some pieces of crusty bread for appetizers. Paired with slightly sweet mango butter and tangy vinaigrette, they stimulate the palate. In just 15 minutes, our orders came —just what we needed after spending the entire half day of enjoying exciting water activities in The Bellevue Resort. 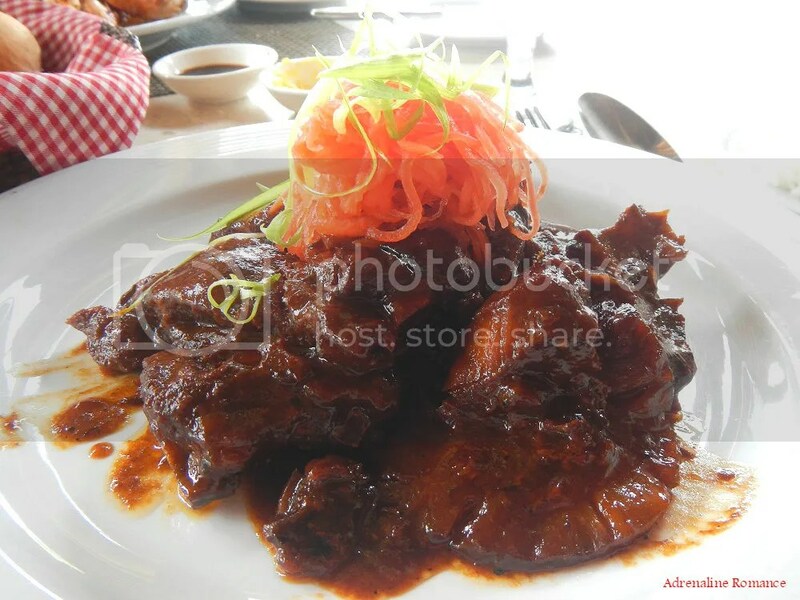 Sweetie ordered barbecue back ribs that are marinated in a special sauce and served with pickled vegetables. Marea Al Fresco serves traditional Filipino and international culinary delights using local, farm-fresh ingredients. Never mind my hypertension and my doctor’s advice to limit my cholesterol intake. 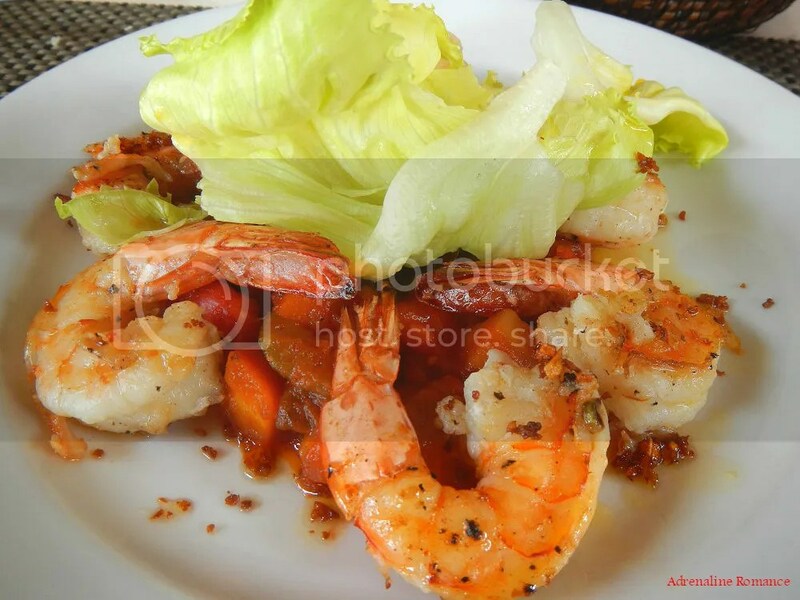 I ordered these luscious grilled prawns with garlic bits. These lovelies are then served in a bed of vegetable ragout. Bon appétit! We actually overestimated our consumption. The servings are actually huge! In fact, we had to request the restaurant to pack our leftovers so we can eat them for dinner! Drinks are ordered separately through a separate menu. 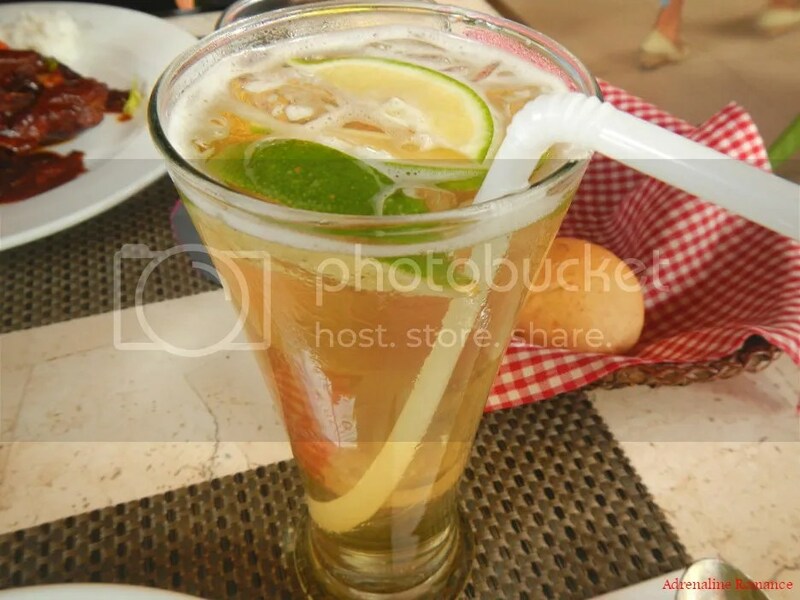 Sweetie missed the regular ice-cold Coke in can while I, feeling guilty after consuming the luscious prawns, ordered this healthy and refreshing, unsweetened lemon tea. 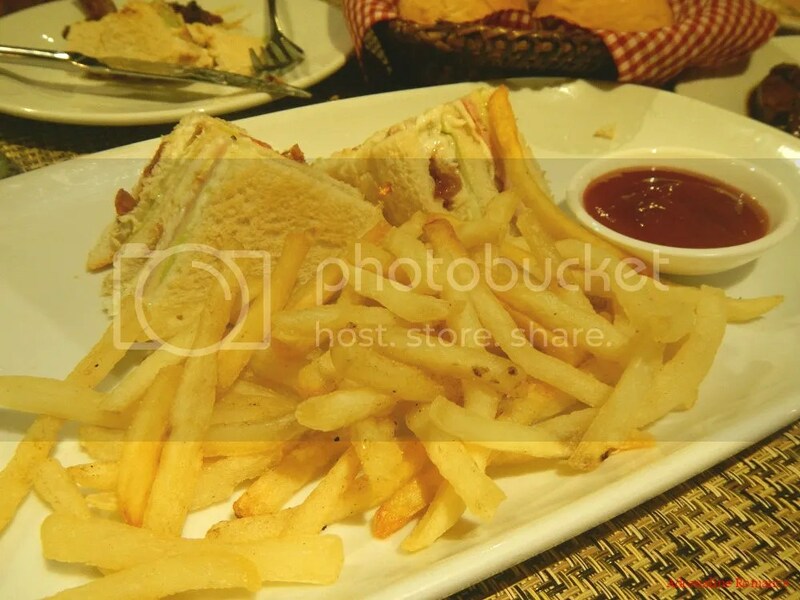 Our evening meal after a thorough massage at the Azurea spa consists of a single large serving of the resort’s own version of clubhouse sandwich. The meal consists of a delicious triple-layered sandwich with fillings made of bacon, chicken salad, cucumber, iceberg lettuce, and fried egg. Perfectly prepared french fries were served on the side. Why order just one? You might ask. Well, remember our heavy lunch? Yes, we simply couldn’t finish the humongous servings. We simply asked maitre d’ Erwin to reheat our leftovers. 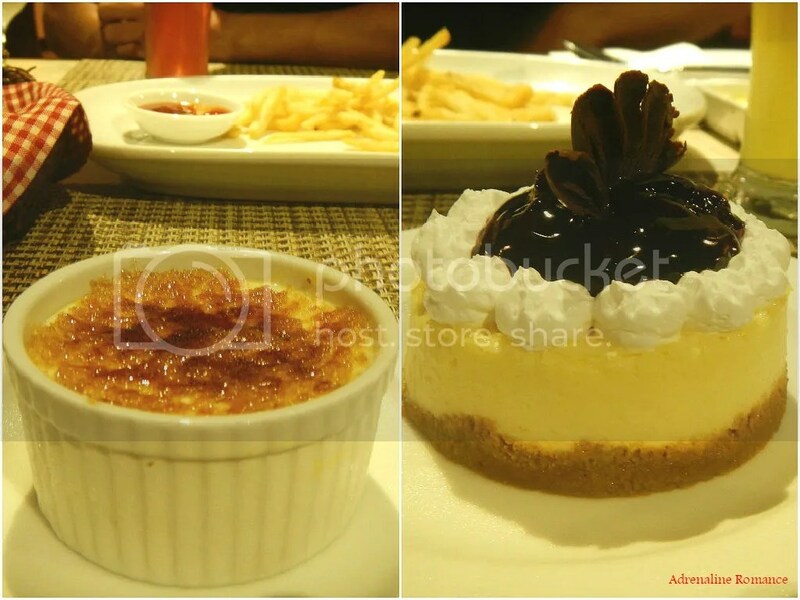 No meal is complete without satisfying one’s sweet tooth. I got sinfully sweet and soft creme brûlée with caramelized top. Sweetie ordered a serving of equally creamy and delightful blueberry cheesecake. We had a bit too much of soda that week. 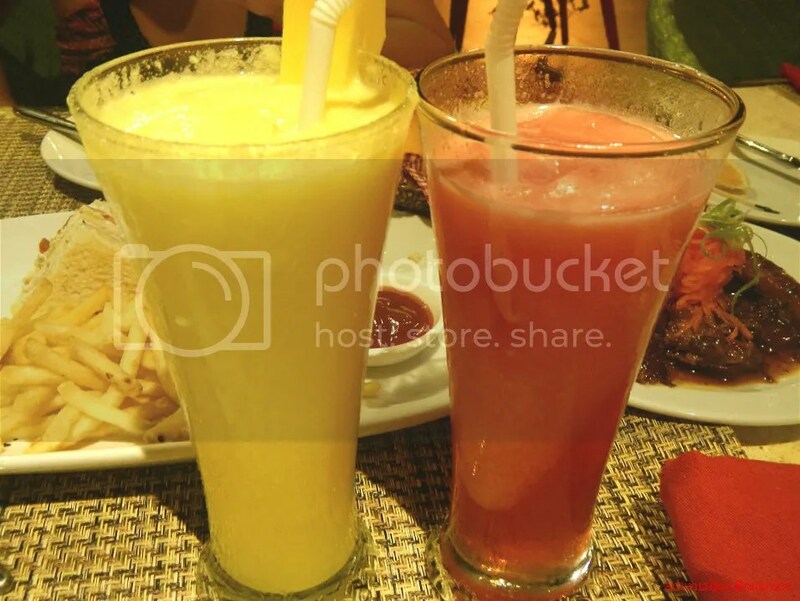 So we decided to drink something healthy—light and refreshing green mango and watermelon shakes. 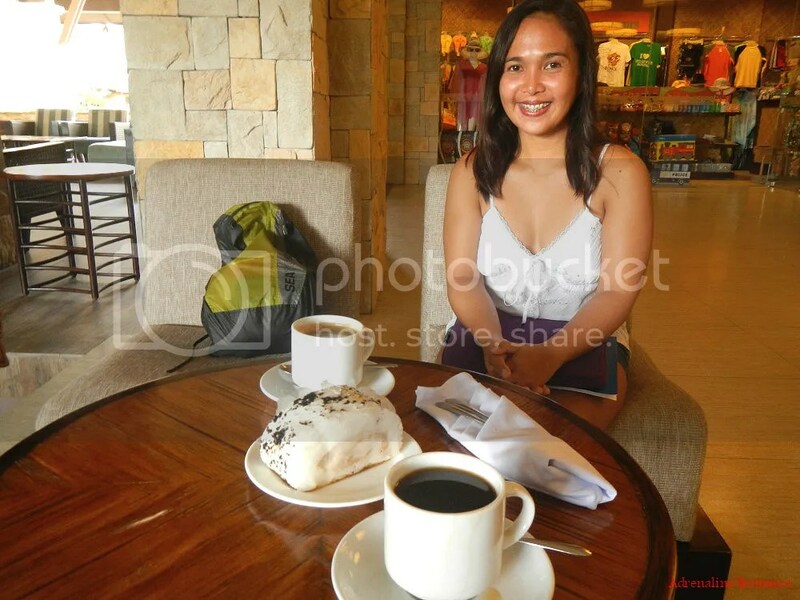 The next day, after exploring the breathtaking dive sites in Balicasag Island, we decided to have a light lunch; we were still quite comfortably full after eating a huge breakfast. So we ordered just one big Bellevue burger with a thick filling made of grilled beef patty, roast beef, and melted cheese. 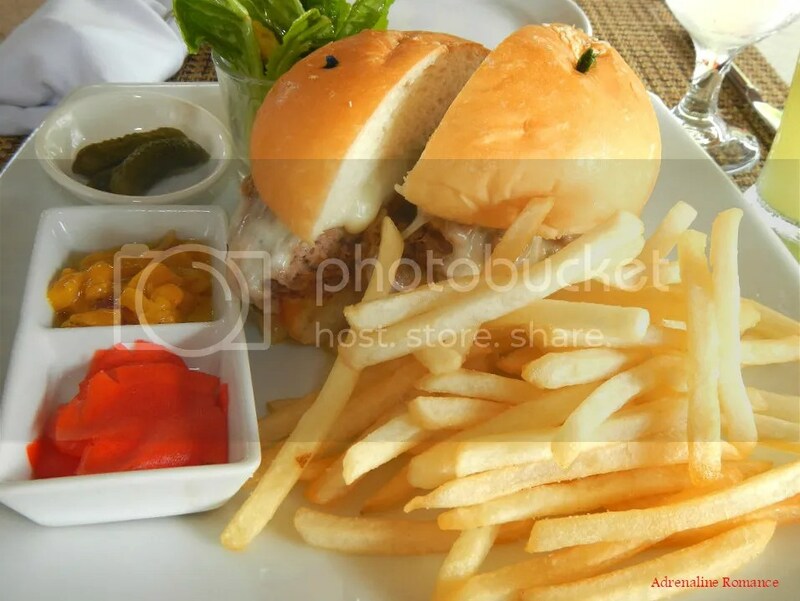 A side dish of pickled veggies and fruits along with french fries soften up the rich lunch’s punch. 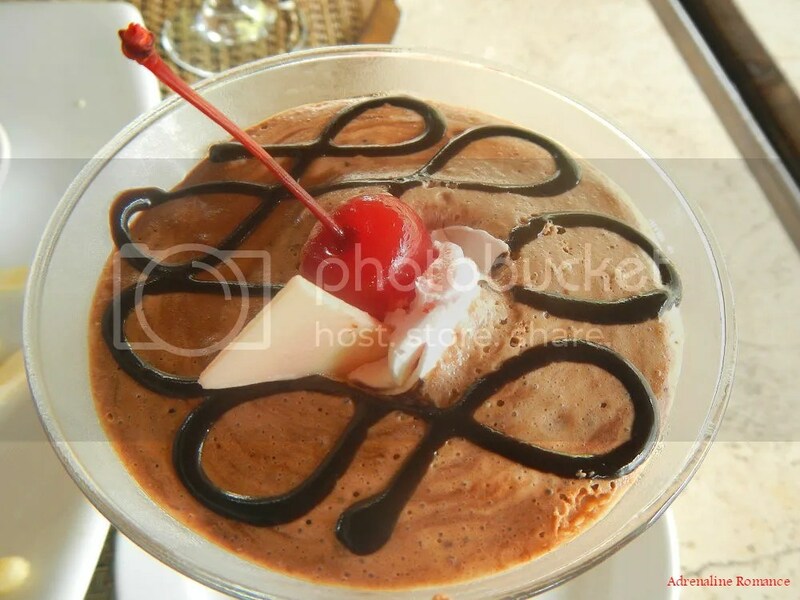 We finished our light lunch with this light and smooth chocolate mousse. Yummy! After lunch, we went back to our room where we took a nap, showered under a stream of hot water, and packed up our bags. It was time to say farewell to this lovely, friendly, 5-star hotel. But our surprise wasn’t over yet. While waiting for our ride back to Tagbilaran port, Erwin took the opportunity to give us a large serving of ultra soft and cottony brazo de mercedes before we hit the road. It is a perfect match for a cup of perfectly brewed hot coffee. Our verdict? Superb is an understatement when describing the delectable dishes served in Marea Al Fresco. 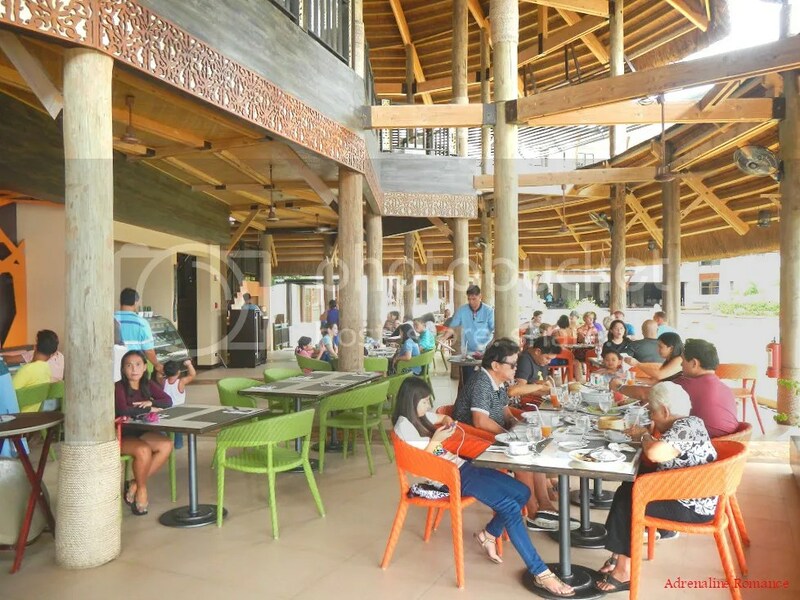 The traditional Filipino architecture of the restaurant, the breezy and refreshing view of the ocean, and the hospitality of the staff all congregate together in a beautiful medley that make your dining experience a spectacular one. In addition, the hefty servings, the high quality of the ingredients, and the wholehearted effort in making a culinary treasure just for you are more than enough to make up for the price. Marea Al Fresco is a must-visit destination for fine-dining connoisseurs. Thank you very much, Ms. Mary Eunice Lodripas, assistant marketing and communication manager of The Bellevue Hotels and Resorts chain, for inviting us to stay in your magnificent hotel for the weekend. We wouldn’t have experienced staying in a 5-star facility if it wasn’t for you. 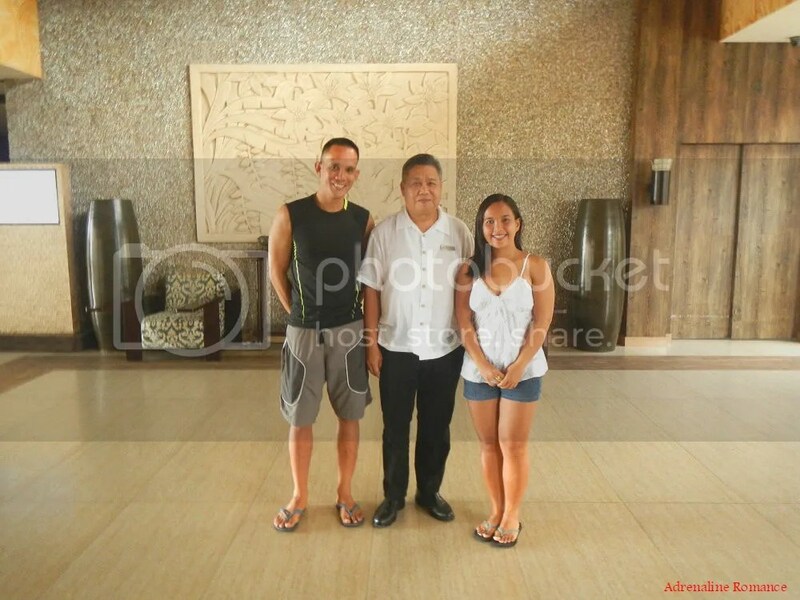 We would also like to give our heartfelt thanks to Mr. Rommel T. Gonzales, general manager of The Bellevue Resort. Our wonderful, one-of-a-kind experience is a testament to your superb skill in managing this world-class facility. You and your staff have set the standard of 5-star resorts to new heights. Special thanks goes to Chef Jason Koppinger, the executive chef of Marea al Fesco and Lamian Restaurants, and the entire kitchen staff of The Bellevue Resort for preparing the sumptuous meals that we have enjoyed. It’s not every day that we get to meet multi-awarded and globally renowned chefs like Jason. With him is his faithful sous chef and wife Jackie who helps in food preparation and restaurant operation. Thank you too to maitre d’ and kitchen supervisor Erwin for providing us insights on the fine dining industry. We salute you, sir! We would also like to thank the customer service staff of The Bellevue Resort for the exemplary services. You should be proud because you have significantly raised the level of world-class quality customer service. We would surely want to personally mention all the names of everyone whom we encountered; unfortunately and obviously, we are unable to realistically do that. So, for everyone in The Bellevue Resort who we failed to mention in these blog posts, we give you a huge thank you! You all have made our stay a memorable one. Marea Al Fresco also caters to groups and small events. In fact, they have their second floor for such gatherings. 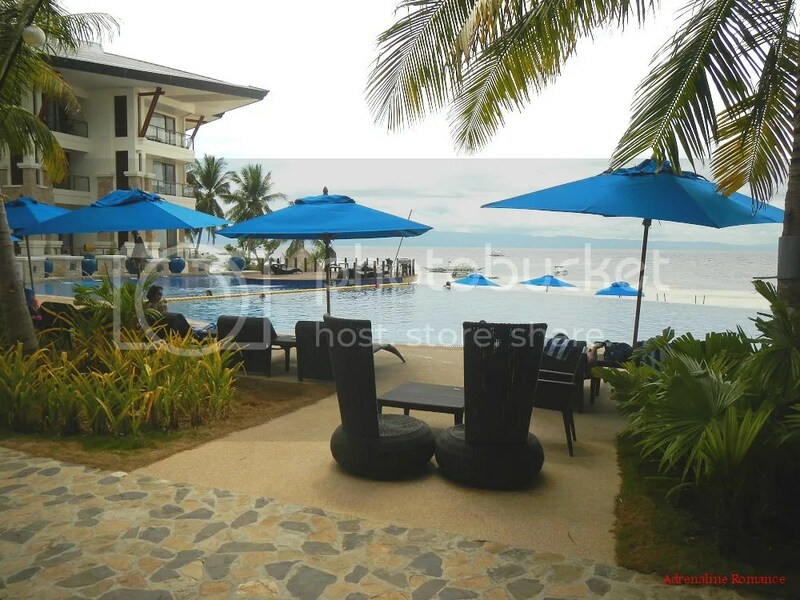 For reservations and more information, get in touch with The Bellevue Resort. Check out their Facebook page for promos and new dishes. Both local and international cuisines are served in Marea Al Fresco. Guests are usually ushered here for their lunches and dinners. They serve à la carte and can seat 150 guests. Marea Al Fresco opens at 11AM and closes at 10PM daily. Oh yes! The prawns are definitely delicious. Never mind the cholesterol. Hehehe! Sure! The food there is really delicious! The food looks delicious 🙂 gosh, I would love to try them all! Ditto here! In addition, the servings are really big. Lovely wooden building. I also prefer that over ugly concrete. I just wonder how it would hold up in a strong earthquake. #shudder Anyway that blueberry cheesecake looks divine! Well, I’m pretty sure its engineers considered its survivability during an earthquake. Oh yes, the cheesecake was sinfully delicious!